Emily Anthes has seen the future—and it glows. That is, at least, for our pets. For as this lively and entertaining book illustrates, animals everywhere are becoming the recipients of biotechnological advances that would make Dr. Frankenstein drool. Though we've long been cross-breeding animals, in recent years it has become possible to create completely new traits in them. One enterprising researcher discovered that you could take DNA from fluorescent compounds in jellyfish and coral and infuse it into zebrafish embryos to make generations of glowing fish. Although acceptance of these transgenic "Glo-Fish" hit a few snags in California, they are now available in pet stores across the country. Consumer desire for novelty has apparently trumped fear of the Frankenfish. And that's only the beginning. 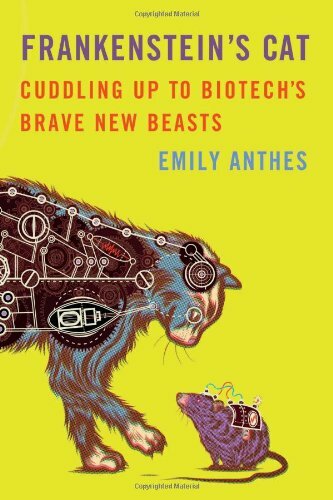 Anthes takes readers on a fascinating—and often very funny—journey though all kinds of biotech applications in the animal world. Researchers have successfully inserted the gene for the production of the enzyme lysozyme into goats to make them produce ultra-healthy milk. A company called AquaBounty has developed AquaAdvantage salmon, which have been genetically engineered to grow to full size twice as quickly as Atlantic salmon. Both are awaiting final FDA approval. Genetic Savings & Clone was established in 2000 to reproduce people's favorite pets for a steep price. When it closed its doors, PerPETuate continued the work, though its recommendation is that pet owners simply put Fido's DNA on ice until cloning technology becomes more efficient. There are plans to "rewild" the plains with DNA from nearly extinct species—kept by the "Frozen Ark Project"—and even to resurrect lost ones. All of this is not without controversy, of course, but you wouldn't necessarily know it from Anthes' sanguine attitude. To be fair, this book is not meant to be a thorough examination of the ethical implications of animal biotech. But it is telling that when Anthes does range into ethical concerns, it is usually to caution against exploiting animals or to raise the question of how much pain the interventions may cause them. For example, DARPA can create remote-controlled cyborg beetles for military use (yes, electronic devices inserted into bugs). Do the bugs feel pain? Should it matter to us if they do? On the other hand, she does not appear to be bothered at all by the fact that we cannot predict what kind of impact AquaAdvantage salmon will ultimately have on the environment or consumers. Her chapter treating the famous dolphin with a prosthetic tail (the subject of the movie Dolphin Tale) is also telling. Although Anthes acknowledges that the primary purpose in developing most of these prosthetics is to improve the technology for humans, she never herself questions the cost of much more (forgive me) flippant uses. Shouldn't one at least consider the ethical issues raised when a culture is willing to pay $1,000 to get prosthetic testicles—called "Neuticles"—for neutered dogs? I guess it depends on whether or not you share Athes' dream, which is for humans to help animals to "transcend their biological limits" so that we can "all evolve together." Christina Bieber Lake is professor of English at Wheaton College. Her book Prophets of the Posthuman: American Literature, Biotechnology, and the Ethics of Personhood is forthcoming later this year from the University of Notre Dame Press.